How do you teach English to kids or young learners? And wait, who are young learners? Is that someone under 40? Generally that term is used in the TEFL course community to describe students ranging from kindergarten to middle school. Yet there is quite a difference in my experience teaching a kindergarten student and teaching a middle school student English. A kindergarten student is going to be full of energy, often affectionate and quite bubbly. They are also going to have a really short attention span. A middle school student has been through the system. They tend to be more tame. but also more hormonal and that can range from totally silent and uninterested to also quite bubbly and mature. Around this age they start getting more pressure in school to succeed which is common in East Asia. Middle schoolers attending private institutes tend to have a pretty high level of English so you can sometimes converse with them a bit more if they are willing. An elementary school student lies somewhere inbetween a kindergartener and a middle school student. This is my favorite age range. Anyways so how do you teach English to these students? Well, it's a loaded question and probably not something you'll learn how to do effectively in a few minutes, but I can help you by giving you a few main pointers. First off you have to be fun, well you don't actually have to be that fun, but you need to make your classes fun. Because children get motivated by having fun. Unlike adults they don't get motivated by a higher salary or a better job. They want to play and they want to have fun. So you have to make your classes fun and you can do that by using games, activities and creativity like drawing, singing, and acting. Despite the fact that you need to have fun in your classes you also need to have a structure to your classes. If you don't have structure and you do have fun then you may have a chaotic classroom and a headache. That won't be fun as your classes can easily get out of control. Structure comes in the form of classroom management, lesson planning and your teaching method. It's not just a matter of adding games you have to integrate the games into your lesson and you need structure. You are most likely going to have a book and a syllabus to follow. Your boss wants your students to enjoy themselves, but he and the student's parents also want them to learn. They have a short attention span. The younger they are the shorter it is. Use variety in your lessons. 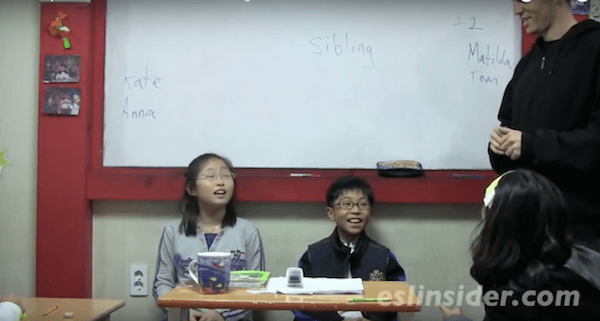 This video has 190,000+ views and shows you how to teach English to kids using a basic "PPP" style of lesson planning. In this step you want to draw your kids in. Here we use a fun activity called "Teacher Says" that gets the students motivated and focused. Here are some warm-up activities and icebreakers. In this step you want to present the material to the students. It can be vocabulary, sentences, numbers, or Q&A. You can teach them the meaning of the word by using body language, pictures, synonyms, opposites, and kinds of. You can have the students repeat the content (vocab or sentences) after you 2-3 times. In this step you want to practice the material. This is a good time to do that using a game or activity. The most common kinds of games to use in this part of the lesson are vocabulary and activities for sentences. Here you show the students how to use the language. You show them how to apply the language to their lives. In the video I ask them, "Who can ____ (swim, ride a bike, etc.)?" In this part of the lesson we use a TPR activity to review the material. Ending on a fun note can be a good idea to. Take this engaging, multi-media online TEFL course especially targeted at teaching young learners. Imagine feeling a sense of confidence in your classroom, control and satisifaction that you're effectively teaching your students.